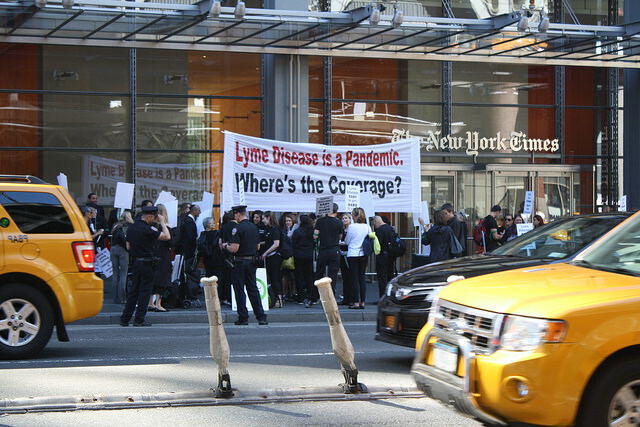 Silent demonstrators dressed in all black, wearing lime green ribbons on the arms, stood in front of the entrance to the New York Times building in midtown Manhattan this afternoon calling for more awareness and press coverage of Lyme disease. “This is really to bring awareness to the plight of Lyme disease patients, the lack of research, and the huge numbers of people that are affected,” said Jill Auerback, the Chairperson for the Hudson Valley Lyme Disease Association. Auerback suffers from Lyme disease herself, and does not believe the state of the disease has improved at all since it was recognized 40 years ago. 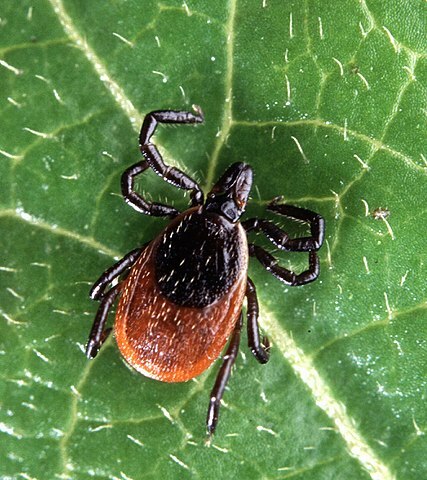 The initial testing to determine if one has Lyme disease often times produces false negatives, and some people who are diagnosed remain sick even after completing a standard month round of antibiotics. In fact, according to the New York State Department of Health, 10 to 20 percent of people continue to experience symptoms that include severe fatigue, muscle and join pain, and frequent fevers. Auerback blames limited research funding for the lack of progress in the field, but also notes that different individualized responses to the disease and its treatment makes it difficult for physicians to properly diagnose and medicate patients. Auerback is concerned with an increasing number of ticks nationwide, and she believes people need to be better educated on tick prevention. Auerback had signs put up in her hometown of Duchess County, N.Y., warning residents of areas with a high population of ticks. Fellow demonstrator Rachel Cipriano, 29, a native of New York City, has suffered from Lyme disease for 15 years. Cipriano hopes the continued efforts from Lyme disease advocates will put pressure on the media to give the disease the attention it deserves. She is also optimistic that the increased exposure will help better inform people who may be misdiagnosed with Multiple Schlorosis, Parkinson, and other auto immune diseases and continue to suffer. 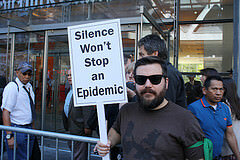 Cipriano said young people need to know that they are not alone in combating Lyme disease. Growing up with it throughout high school and college, Cipriano felt that her friends didn’t understand when she complained of the side effects. Unlike Cipriano, 31-year-old Josh Tocco does not have Lyme disease. Tocco who lives in Goshen, N.Y., volunteered to join the demonstration in support of his wife and brother in-law who suffer from the illness. Each of them had not been feeling well enough to make the hour and a half trip down to the city from Goshen.